The four hymns of Laav are performed during the four nuptial rounds of the the Sikh wedding ceremony. Each of the four Laav has a special significance and describes the marriage of the soul-bride to the divine husband. The hymns outline the progressive stages of the awakening soul-bride as she advances spiritually to ultimately blend with the divine groom in the dawning realization of her divine destiny. The Lavan hymns are compositions of Guru Raam Das, and were written for the occasion of his own wedding to Bibi Bhani. They are meant to fuse the soul of bride and groom into one conscious being who is subsequently wedded to God in spiritual union. The verses of the Lavan are from the scripture of Guru Granth Sahib. The Gurmukhi words are spelled out phonetically here and appear above an English interpretation of their meaning. Rather than reciting hymns of the Vedic Brahman, embrace the righteous conduct and renounce sinful actions. In the second round of the marriage ceremony, the Lord leads one to meet the True Guru, the Primal Being. Fearing God, the mind becomes fear free and the filth of egotism is eradicated. In fear of the Immaculate Lord, sing the glorious praises of the Lord thereby beholding his presence. The Lord, the Supreme Soul and master of the universe is pervading and permeating everywhere, fully filling all places and spaces. Within or without there is only one Lord God, meeting together the humble servants of the Lord sing the songs of joy. Meeting with the humble saints of the Lord, by great good fortune God is found. The Immaculate Lord is found by singing the glorious praises of God, by uttering the word of God. The humble Saints, by great good fortune attain God when describing his indescribable description. The Name of the Lord resounds within the heart while contemplating God, when one realizes the destiny inscribed on their brow. In the fourth round of the marriage ceremony, the mind becomes peaceful having found the Lord. The Guruâs disciple meets the Lord with intuitive ease when surrendering sweetly the mind soul and body. The Lord seems sweet to the one possessed by God who is lovingly attuned night and day on the Lord ever. The heartâs mind becomes fruitful and attains its desire when the Lord's name resoundingly resonates within. The Lord God Master blends with the bride whose heart blossoms in the illumination of his name forthwith. 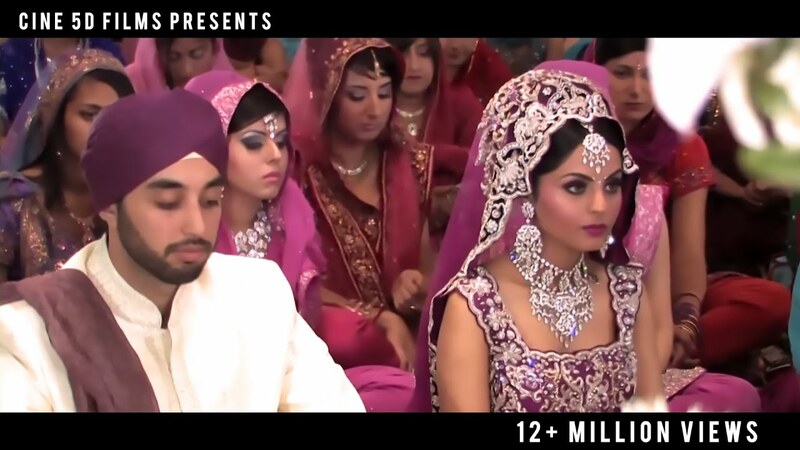 Sikh Wedding Hymn, "The Four Laav"